We have a baby to name. A new calf, spry and healthy; a female that will eventually have a calf of her own and give countless gallons of milk in the years to come. 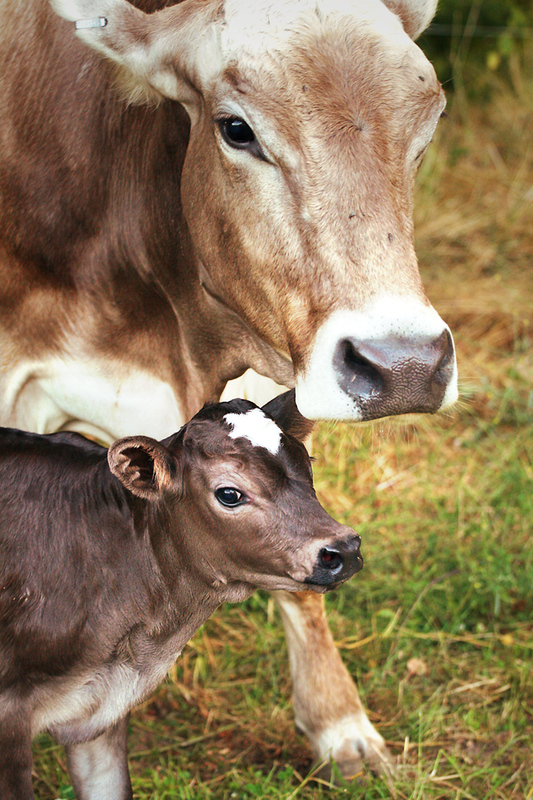 Born to first-time mama Pearl, who was also born on our farm a few years back, making her baby a third-generation addition to the bovine Sea Breeze Family. The naming of a new cow is an honor, and it is the farm crew who ultimately enjoy the naming rights. As they should; often they are the midwives of these new babes, witnessing and assisting with their arrivals, at times just hours before heading to the farmers’ market. (Yes, our crew that serves you at the market booth are the same folks that work and run the farm. Ask them about it.) The names are also crucial for general livestock management; we do not pierce our cows’ ears with number tags, so their names are every bit as important and necessary as any human’s that is associated with the farm. Lucy was our first cow –she was named by her previous owner– and remains the matriarch of the herd, always insisting on being milked first; a solo Holstein in a sea of Jerseys and Milking Shorthorns. Then came Guadalupe (“Lupita”), then Teeny (our biggest cow), then Chocolate Soup. Our daughter was three at the time, and Chocolate Soup was an accurately descriptive name of her rich coloring. Chocolate Snow soon followed, also accurately descriptive of the cow’s mottled appearance, though considerably less appetizing. 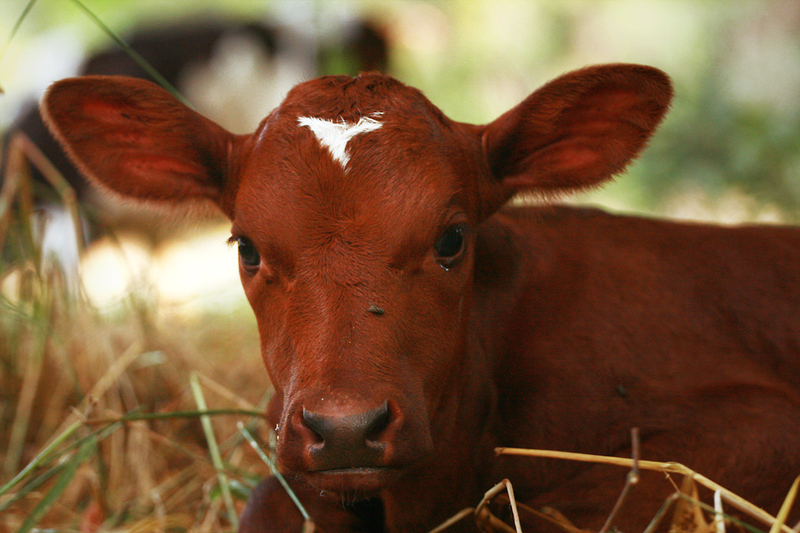 Names were given to subsequent calves in conjunction with the events of their births. Magdalena (“Maggie”) was born Easter Sunday. Cypress was named after the century-old tree that was taken down on her birth day. Luna was born under a dramatic eclipse. Strawberry born the weekend of her namesake’s festival. Hussein came into this world the day The President was inaugurated. At some point we turned to Country Western singers for naming inspiration. Into our life marched Hank, Emmy Lou, & Dusty. And now Pearl’s baby will most likely be dubbed Lucinda, Loretta or June. George liked Dolly–we’re hoping for a big udder– but as a friend aptly pointed out, the calf is clearly a brunette. Yet in all honesty, sometimes a carefully crafted given name simply gives way to a sticky nickname, as it is with humans from time to time. Lucinda/Loretta/June might just be “Noodle” for the rest of her natural-born life on Sea Breeze Farm. And so it goes. Getting married yourself is one thing. Someone entrusting their wedding to you is an entirely different beast. Especially when you’re not exactly in the wedding business. But indeed, our dear friend Matt, who at that time was the Sea Breeze Farm manager and his bride Mary, did just that. We were tremendously honored when Matt and Mary told us they’d like to get married on our farm. And given the many concentric circles of family and friends from Chicago to Los Angeles, it promised to be a boisterous affair, complete with an impressive cadre of chefs; Matt Dillon of Sitka & Spruce, Kurt Timmermeister of Kurtwood Farms, & Justin Neidermeyer of Pian Pianino included. (Spinasse was pure imagination at this point.) Not to mention a pig on a spit, sword dancing, the Tarantella, numerous toasts, and even more Italian aunties consulting on all aspects of the wedding feast. Of course, despite the festivities, farm chores needed to be carried out that evening. In the days leading up to the big event, I convinced Matt that he really didn’t want to be responsible for milking the cows in the middle of his own reception. He resisted, but eventually succumbed, and later I think he was glad. But indeed they were milked. Physically, in the middle of the reception. Hey, it’s a farm. Mary was stunningly beautiful. Matt was charming and dapper. And even after they traipsed down the driveway, hand in hand, Matt swinging a vintage suitcase, the party in their wake continued. Eventually darkness settled in and the last of the guests trailed off. At which point, Justin whipped up another batch of pasta, and a small group of us gathered around the picnic table, dined under the stars, and toasted the newlyweds. Just as weddings should be. Our farm manager discusses why farming isn’t for everyone, and why she is so good at it. What are you doing to prepare for the winter season at Sea Breeze Farm? Most of the preparations for winter have already happened. For us, winter has already begun, especially because of the rains. So to prepare, the most important things are to make sure there is adequate shelter for all of the animals. The pigs have little houses, with straw inside. It’s really important to make sure the smaller animals have a shelter to get out of the rain, as they will get chilled really easily—and then disease or death sets in. We’re putting in hay. We’re also doing winter seeding. Oats, wheat’s and barley are getting seeded in. It’s going in the back pasture. It’s going to be either a forage crop or harvested, we’ll see. It’s basically a winter wheat crop. In this climate, you can plant it in the winter and it’ll grow slower, but it’ll be ready in the spring. It’s the first time we’ve seeded in a forage crop that isn’t a perennial. We’ve seeded in grass before—if a certain spot needs a little help. But, that back pasture, where the pigs are now really needs it. And the pigs are turning it all in and are fertilizing it. It’s going to be really great. The cows can either graze it by letting it get really high–or we can harvest the grains ourselves for animal feed–or people feed for that matter! We do have some really nice scythe’s that George got us, so we could go out there and harvest it with our scythe….it would make really good beer probably. But we’ll probably let the cows eat it because it’s good for them too. 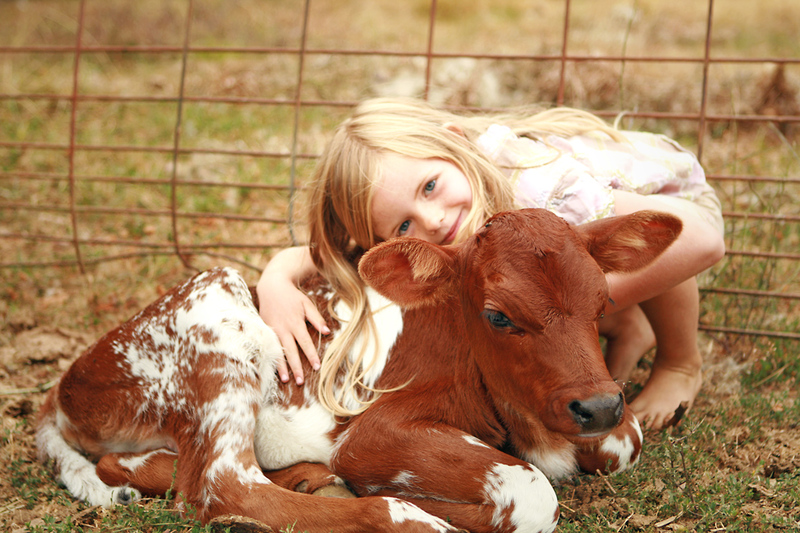 You are also a part owner of Ekone Ranch, a camp which teaches sustainable living to children. Yes, that’s true, guilty as charged. And this is your 3rd year at SBF, what compels you to continue working as Farm Manager at SBF, as opposed to focusing solely on your own business with the camp? Well, because of the diversity of what I get to do here. Really for the most part (despite the 12-16 hour days) I feel really honored that I get to work here and that I’ve been given an amazing opportunity to learn and to try new things out and to grow really amazing food in a way I couldn’t do if it was my farm. Since so much has already gone into this place, so much life and energy, and so much amazing drive and every-one who works here is really cool and inspiring. Yeah, so that, and at the ranch no one really likes to eat meat or kill animals. I have to come here and get my meat fix. Well, you’re at the ranch a lot in the summer, some in the fall, and a little bit in the winter and through-out the year. Why do you think George acquiesces to your particular schedule? Is this really part of the interview? I would say it’s probably because he can’t find anyone else to do what I do, which is understandable. It is a really weird job. It’s the kind of job which does not have a lot of really successful, well educated professional farmer applicants. And anyway, they would not be able to do this job as well as I do it. We need to do things a little differently here because of the size of the farm and the goals we are trying to achieve are really different than any farm I’ve been at before–while maintaining the ethos of the small-scale farm model. The first guy I farmed with, Leslie, he taught me a lot about straightening bent nails and using bailing twine to keep your barn together–all of the things you have to do when you’re a farmer. This is not a position where you’re going to make a million dollars. And yet you receive about 20 emails a month from folks who want to farm. What would you tell the would-be farmer? I would say the best thing is to come be an intern. The best way to learn is through experience. Though, I don’t really know where people got the idea that farming is glamorous. Yes I have an idealistic aspect to it. I think all of us here believe in what we’re doing—or else we would not be able to do it so well. A lot of the people that want to come and work have an idea that it’s fun all the time. And it’s true that it is an enjoyable job—and for me, it’s a lot better than being behind a desk in the city. But I think people get confused between what is satisfying work and what they think is easy. I think there are only a few people in our society now who know what hard work is. A lot of people just assume something you do that is not bad is going to be easy. So, I would tell them that it is not easy. 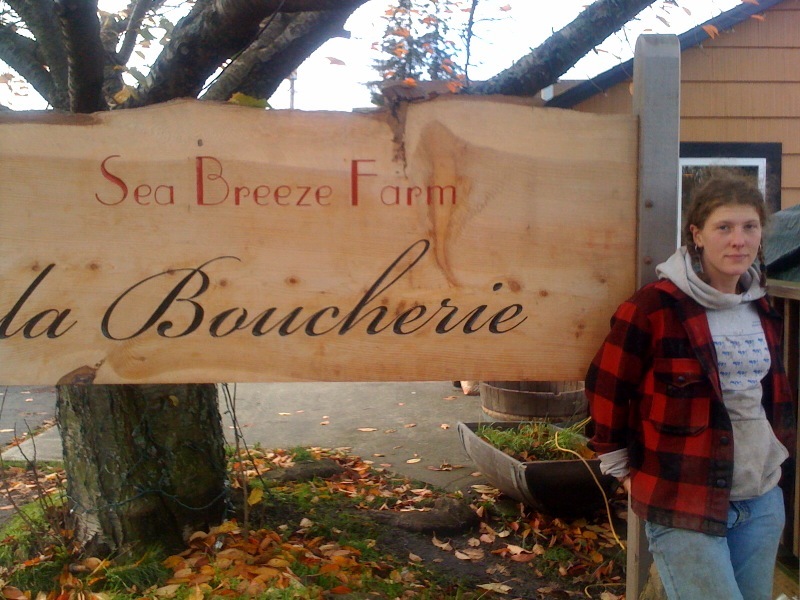 This interview was conducted and edited by Matthew Lawrence, and is the first in a series on Sea Breeze Farm employees. If you have a specific questions for Liz, feel free to use the comments option on this site to do so.